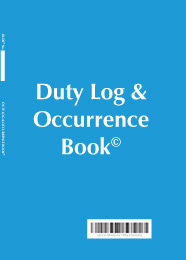 The Duty Log & Occurrence Book© fills the need for a definitive record for all staff involved in on call duties. Designed for individual post holders, it allows a legal record to be created for future reference. This enables an organisation to fulfil its obligation to have a record of information received and actions carried out for a period of duty, or for more protracted occurrences, information about which may be contained within a number of books. For use by Duty managers, Headmasters & School staff, Local authority managers, Playground/swimming pool staff, Sporting event managers, Night watchmen, Hotel duty managers and Security or others involved in on-call duties. Size: 305x218x15mm, Weight: 700g. Sequentially numbered book with 147 sequentially numbered pages. Hard cover, plastic coated.